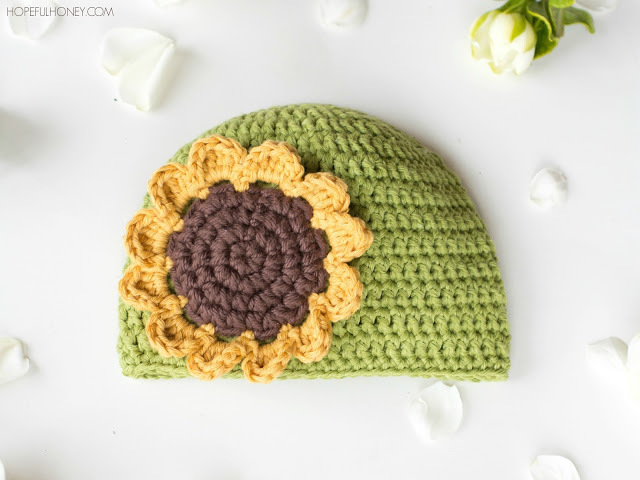 How adorable is this Sunflower Baby Hat crochet pattern from Hopeful Honey? Nothing puts me in a spring-y mood like some bright florals, and the green and gold of this adorable crochet baby hat pattern are just the thing to brighten up the dreary last days of winter. If the sun itself is hiding behind some clouds, you can still keep you day cheery and bright by making this hat for a friend or family member’s baby (if you don’t have your own, that is!) There’s just something about sunflowers that makes me think of warmer, happy days. Any new mom would love this adorable baby hat for her little one!